Oh, it is a good thing to have a refrigerator full of caramel sauce. When I set out last week to make a pot full of caramel sauce, I truly intended to pass it on to well deserving friends and family. As the days wear on however, I can see the supply dwindling. The problem is… it is really good! (If you don’t yet have a fridge full, check out my post on Edible Gifts! Chocolate and Caramel Sauces. ) First was the obvious, caramel over ice cream (which has possibly converted this chocolate faithful to the caramel side of the ice cream shop), then apples dipped in caramel (it’s OK to eat it as a snack then, right? ), and then putting it all together for one holiday worthy dessert. Tonight’s dessert was part apple crisp, part caramel apple, entirely decadent and yet homey, the caramel apple tart. This recipe has been sitting in my “someday I want to make” pile for over a year. It was originally published in Bon Appetit magazine, May 2009 by Matt Lewis and Renato Poliafito and originates at the restaurant, Baked, in New York. Here is the concept: individual tart crusts, baked off in advance, then layered with caramel sauce, sauteed apples, and crisp topping. These tasty tarts are then baked again until the sugary syrup bubbles up and the topping browns. The original recipe suggests pairing these with Cinnamon-Rum ice cream (and provides a delicious sounding recipe- you should check it out on Epicurious). I couldn’t manage the extra prep, so I topped it with good ol’ vanilla and a drizzle of caramel sauce. No complaints. This recipe is elegant enough to serve for guests, but could easily be cut in half if you are cooking for a just few people. It makes 6- 4 1/2 inch tarts or you could roll all the dough out into one 9 or 10 inch tart. (The individual tarts are special, but pretty big for one person. We ended up cutting them in half and that was plenty after a big dinner.) It is best to use tart pans with removable bottoms if you have them. (Thank you, Santa!) If you do not have a tart pan, you can still enjoy this dessert. Either put the crust into a pie pan or create a free form tart on a baking sheet. There are a number of steps in creating these tarts, but most can be done in advance. This makes it a great dessert for entertaining. I baked off the tart shells and made the filling and crumb topping all before our guest arrived. Just before dinner I assembled the tarts and slide them into the oven. We ate warm tarts for dessert without having to fuss with them while our guests were here. In a food processor, mix the flour, sugar, and salt. Cut the butter into 1/2 inch cubes and drop into the running processor. Pulse until butter is slightly smaller than a pea. Add egg and pulse again until mixed. Dough should cling to itself when pressed together, but still be fairly dry. If it needs a little more moisture, drizzle in 1-2 T ice water while machine is running. Do not over-process. Remove dough from food processor, form a disc, wrap in plastic wrap and refrigerate at least one hour. Preheat oven to 375 degrees. Bake crusts until golden brown, approximately 25 minutes. (Keep an eye on them. They may cook faster or slower depending on the thickness of the dough and your oven). Cool on a rack completely before assembling. (Can be made 1 day ahead. Cool completely then store in an air tight container at room temperature). Blend flour, butter, and salt. 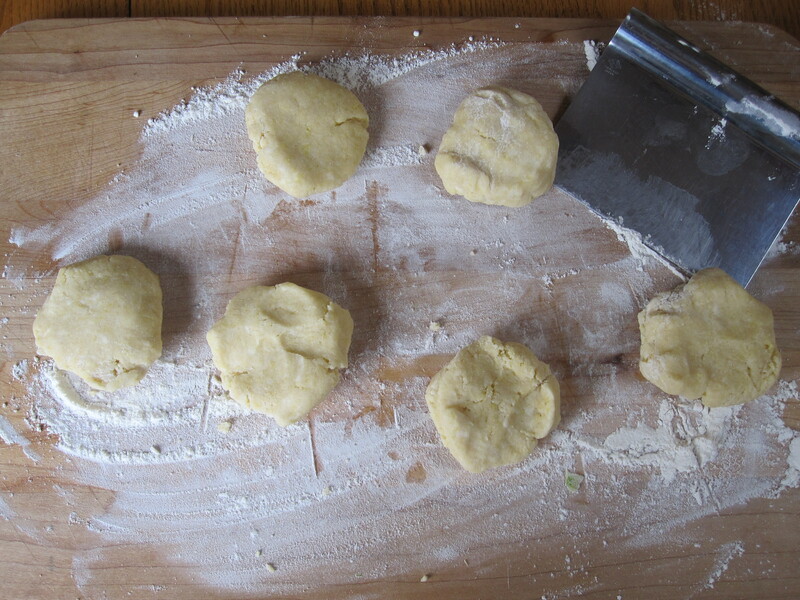 Cut in butter with a pastry cutter or fork until it is in tiny flour/sugar covered clumps. Mix in the pecans. (Can be made ahead and refrigerated). Whisk brown sugar, cinnamon, and cornstarch in a small bowl and set aside. Saute apples in butter until they begin to soften. Add sugar/ cornstarch mix and continue cooking until bubbly. Add vanilla and whiskey. Cook until liquid begins to thicken. Remove from heat. Set aside, cover, and cool. Spoon 1-2 Tablespoons of caramel sauce over the base of each tart shell. Divide the apple mixture into each tart, leaving most of the liquid behind. Top with the crumb topping. Bake at 375 degrees for 25-30 minutes until the juices are bubbling up and the topping is beginning to brown. Cool on a rack 5 minutes. Gently remove from tart pans. Cool 10 more minutes on the rack. 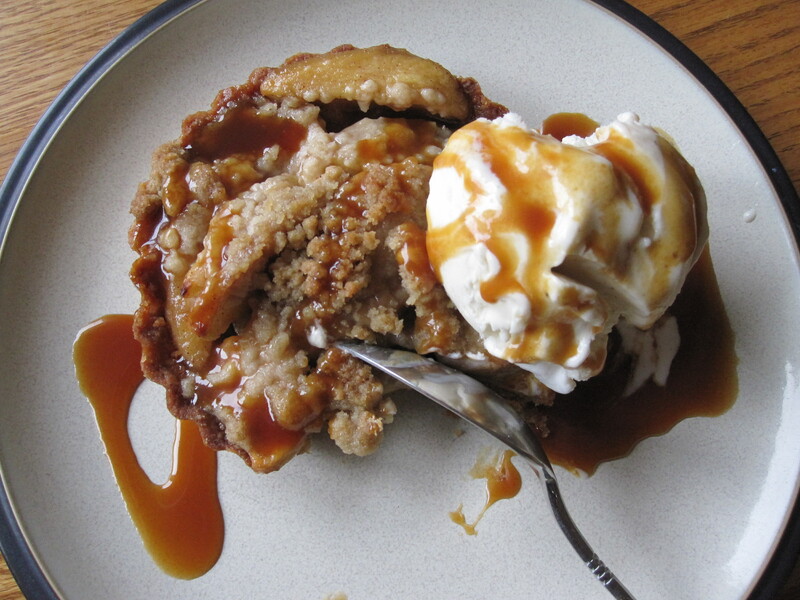 Serve with ice cream and a drizzle of caramel. Yum! My mouth started watering while I read the recipes. I’ve wanted a good tart crust recipe too. These tarts taste as great as they look! Nice pix Karen, looks & sounds dee-lish. Who can resist a tasty combo of tart & crisp, esp. when caramel is involved. Ha-hah, my insidious foodie vices are beginning to have their way w/you.. first pork and now caramel, mwah-ha-hah! Site is lookin’ great. Don’t know how you find the time but, rock on Sister! 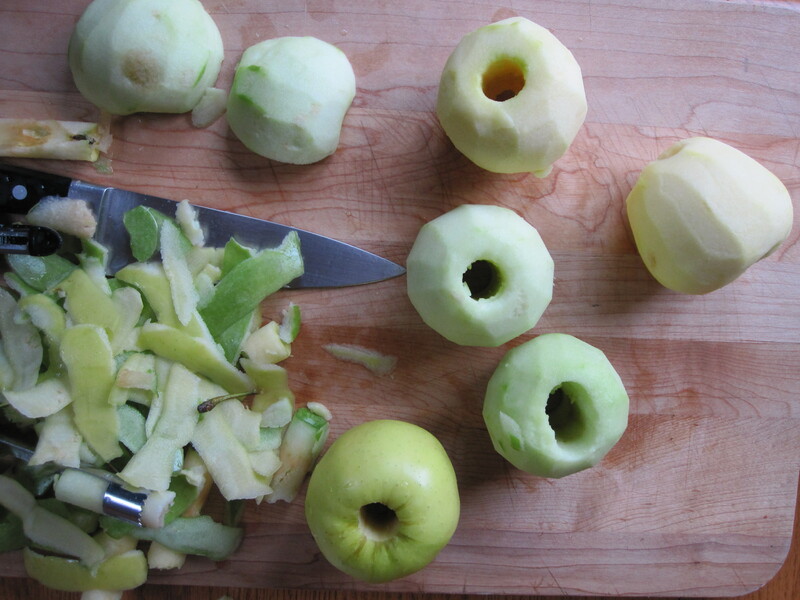 Do you have an apple peeler? I have an extra I could share with your family. You might find it so easy to make these apple tarts that you could make them once a week! Yum! No, we don’t have one. Every fall when the apples are ready for applesauce, I have to borrow one. Hmmmm, apple tarts every week, I like that idea!